PENTICTON, BC – Cannery Brewing has announced the release of a latest beer in the Artisan Creations series of art-inspired limited one-off brands from the brewery. It focuses on the unique flavours created by the teamwork of Belgian yeast and Candi sugar. A simple background of Pilsner, ESB, Special B and Carfa malts bow to the shocking flavours of the yeast and sugar. We’ve wanted to create a beer in this style for some time. We really wanted to push the boundaries with this one and we’re pleased with what we were able to create. 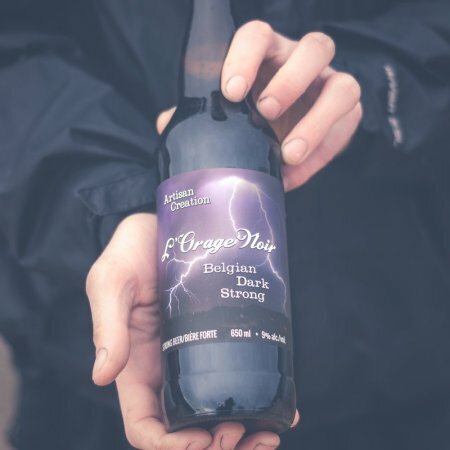 As with previous Artisan Creations releases, the label features “an artistic creation designed to match the artistry of the beer.” In this case, it’s a photo of an Okanagan lightning storm taken by photographer Caillum Smith from Preserved Light Photography. Cannery L’Orage Noir is available now in a single batch of 650 ml bottles at private liquor stores and restaurants throughout BC and select liquor stores in Alberta while supplies last.